I love to feature anything about play. The following interview highlights a great company with a passion for creating comfortable sleepwear, thermals and play-clothes for babies and children up to age 12. Simply Merino: I am a mom of a toddler (Jack), teacher and business owner. I am extremely busy, but I love what I do. 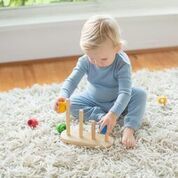 ProEd Toys: What was the inspiration behind starting Simply Merino? Simply Merino: We essentially wanted to make kids pajamas that were 100% organic without using a fire retardant chemical. It is mandatory to have some kind of chemical to resist fires in kids pajamas up to age 14. These chemicals are not regulated, and therefore could possibly harm your child without you knowing it. Merino wool is naturally fire retardant, so there is no need for any chemicals, which helps both parents and kids sleep better. ProEd Toys: What makes you laugh? Simply Merino: Jack for sure….he is so funny! ProEd Toys: What makes you cry? Simply Merino: I am quite the cry baby, and can cry at about anything. What really hurts my soul is whenever my family cries. ProEd Toys: What is your passion? Simply Merino: Since I was a little girl my passion has always been travelling. I find it incredibly fulfilling learning about different cultures and seeing life outside of our Canadian bubble. I also really love eating, and love eating my way through countries. To read more of this blog post, please visit www.proeducationaltoys.com and find us on their blog.